– Want to join Máire and many more in this year’s MiniMarathon? Sign up here! I’ve walked the VHI Women’s Mini Marathon the past two years for very important reasons. In 2017, it was with a group from Love Both and I was sponsored to do it. Truth be told, were it not for the sponsorship, I probably would’ve backed out. It was the longest single distance I’d walked and it was tough, but walking with company and championing life made it worth it. As did the many, many women walking for other charities who thanked us for our visible witness to the pro-life cause. That year I felt supported and part of something big. I knew there were so many women on the route with me who had my back when it came to this important issue of life or death, and I felt bolstered. 2018 was a different story. I registered a few months beforehand after finding out the referendum on abortion would be held two weeks before, at the end of May. I resolved that no matter the outcome, I would walk that route once again. Of course, I never dreamed the Irish people would vote against retaining an unborn baby’s right to life. Then the referendum happened and the result made me determined to show that pro-life people had not gone into hiding, licking our wounds. I was sure, beyond anything else, that I was going to walk the 10km that day in defiance of what the majority of my generation voted for. This time I wasn’t sponsored, I didn’t raise any money, there’d be time enough for that. The 2018’s Women’s Mini Marathon was about more. It was about showing resilience, showing that abortion advocates may have won the battle but we would win the war. It was about showing anyone I encountered who voted Yes that I hadn’t gone away, that I wouldn’t be shamed into being quiet, that I was ready for whatever the next battle for the pro-life movement was. It wasn’t easy. I had an urge all morning to hide my pro-life gear. I felt like anywhere I went in Dublin, I was being stared at. The referendum was still so fresh for people. The day itself had turned disgustingly hot, there was no air and the slightest movement took so much effort. I put my headphones on and away we went. The music blaring through the headphones was as much to stop anyone coming to talk to me as much as it was to push myself on. Around the 4km mark though I started to relax a bit as a couple of women had approached me to thank me for wearing the Love Both t-shirt. One woman told me she had voted No and had found the previous fortnight since the referendum extremely hard and so my wearing the t-shirt publicly, gave her great hope. An older woman who was standing on the route cheering us on stopped me briefly to thank me also. And on and on it went. Each woman that spoke to me gave me hope and gave me strength. It was an odd feeling. All I was doing was wearing a t-shirt, but it was that act of defiance that was letting people in despair know that they weren’t alone in cherishing all human life. Towards the end, I met a friend from work who was also participating. I knew she had intended to vote Yes a fortnight previously. She was with her sister and I worried whether she’d be embarrassed to know me, given what I was wearing, but she welcomed me and we walked the last 3km and crossed the finish line together. We took our photos and celebrated together and she never once passed a remark on my t-shirt or my reason for participating. I was relieved but surprised too. My own expectations of her reaction just showed me how divisive this issue is and how important it was to take the stand I did. 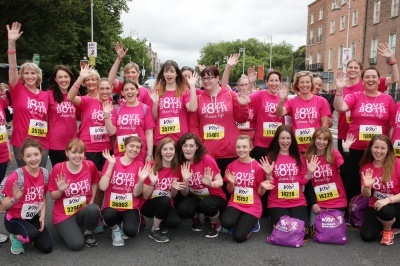 This year I’m walking the Women’s Mini Marathon again with a team from Love Both. This year, I will once again be sponsored (hopefully) by people eager to see the good work Love Both are doing continued – like the Show Your Love Initiative for vulnerable mothers. This year there will be security in numbers and we’ll show that the pro-life movement aren’t going to be pushed out of the public eye, much as those who advocated for abortion might wish. This year will be different, but it will still be a challenge. For me, as well as representing the pro-life movement and raising funds for organisations like Love Both who do tremendous work for mothers seeking their help, I have a previous time to beat and I know with the Love Both team behind me, I can do it!